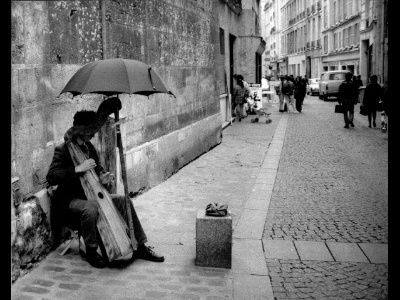 I was wandering around Paris taking in the sites when I turned down this small alley way and saw this street musician playing a wooden harp. There was no one around listening to his music, yet he continued to play and play. I took this photo without him knowing it and then went over to his bag on the post and put some francs in for his beautiful yet lonely music.